Busy playing Modern Warfare 2 on Xbox Live in the UK? Your government may be looking to get you into actual Modern Warfare soon. Before you ask: No, this isn't some sort of Last Starfighter thing where the UK government looks at the people topping the leaderboards and then shows up at their house in suits and sunglasses to give them special top-secret assignments (or at least, I don't think so). 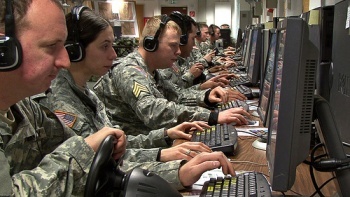 According to Marketing Magazine UK, British intelligence agency Government Communications Headquarters (GCHQ) will be advertising recruitment and career opportunities with the armed forces over Xbox Live. The six-week-long campaign will target 18-34 year-olds - not coincidentally the major Xbox Live-using demographic - and though the site claims that it "will include streamed video banners within the games," I'm not sure if this means that the advertisements will actually appear in multiplayer matches, or if it will just be a Dashboard thing. After all, for all it might be a good idea to try to recruit people while their adrenaline is pumping from the thrill of simulated battle, it might break immersion a little bit to see recruitment ads in the middle of your ODST match. One presumes that the military will be offering up additional training for those gamers who enlist, unless they've really bought into the idea that games can actually teach people how to shoot a gun.